Educational Bytes is just one of the FREE Educational Services that Acorn Internet Services, Inc. provides to our clients. These “Educational Bytes” are just that — Short Video Clips or “Bytes” based current topics of interest. Whether you are a Web site marketing beginner or you’re a proficient Internet DIYer, these free SEO resources from Acorn-IS will be a valuable asset from promoting your business. Each topic is covered in a simple to understand video format that will allow you to see exactly how to “DO” or “ACCOMPLISH” the steps to complete the process described in detail for each topic recorded. 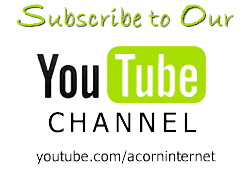 To view any of the “Educational Bytes” Videos below, simply click on the corresponding YouTube icons. (.057) August 25, 2014 – Why do so many Innkeepers have no Mobile Presence? (.011) Nov 11, 2010 – Should you Trash your Flash in Light of Google Instant Preview? (.005) Oct 08, 2010 – How to use the @Mention in Facebook! (.001) Sep 21, 2010 – Where Did the Google Wonder Wheel Go?